Step 2 Add the onion and garlic and cook for 5 minutes until soft. Add the cauliflower florets and cook for a further 5 minutes, stirring the cauliflower so it does not burn. Add the walnuts and stock and bring to the boil. Cover and simmer for 15 minutes. Remove from the heat, add the Stilton cheese and blend until smooth. Step 3 Slurp and enjoy! I love this flavour combination for cauliflower cheese so thought I’d see how the ingredients worked for a soup. It’s a lovely winter warming soup although the use of the walnut does not give the soup the most bright and welcoming colour. 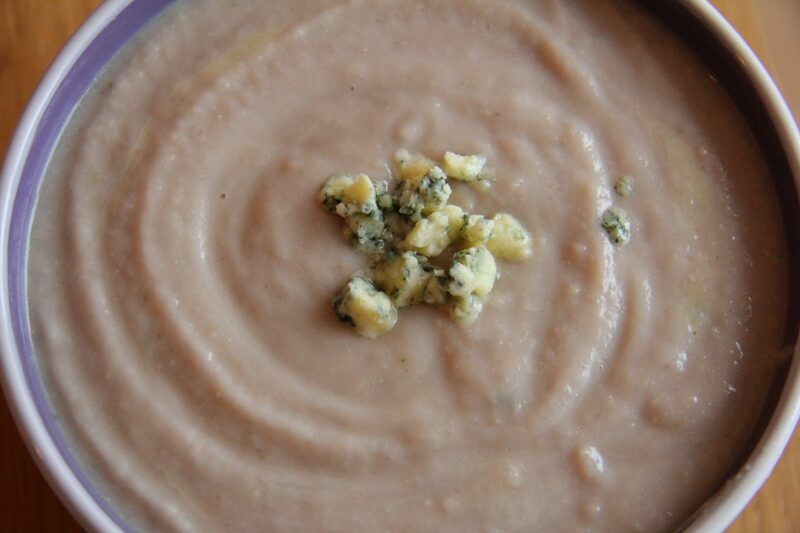 The cauliflower gives the soup a lovely thickness and the Stilton gives a lift in flavour. If you do not like Stilton perhaps a strong Cheddar cheese would work.